Buy Wunderbrow online at Boozyshop, the makeup webshop that makes online cosmetics shopping fun! Always beautiful eyebrows without major changes, Wunderbrow is a semi-permanent eyebrow gel that stays there for days. Easy to apply and a nice result, the wish of every woman. Wunderbrow is the solution for thin or light eyebrows, but also for loss of eyebrow hair. In addition, this is the ideal make-up when you are not satisfied with the shape of your eyebrows. Start the day well and let yourself shine with perfect eyebrows. 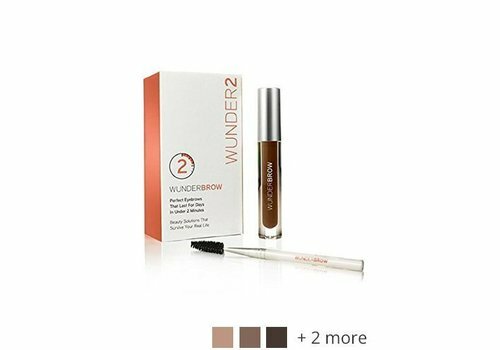 Wunderbrow from the brand Wunder2 knows exactly what women want. Incidentally, this eyebrow gel is also excellent for men to use. A comprehensive range with the best makeup products for eyebrows is available at Boozyshop. At Wunderbrow you can choose from different shades of eyebrow gel. With colored eyebrow gel you give your eyebrows the desired color. So you can pick up the color a little or make it darker, you can also keep the same color as your eyebrows. We advise not to take too big differences, so that the result remains natural. For dark eyebrows we have Wunderbrow Black / Brown in our range, applicable to both brown and black eyebrows. Wunderbrow JetBlack is a dark eyebrow gel that is suitable for women with dark hair or for an elegant look. For the slightly lighter shades we have Wunderbrow Brunette and Auburn. Do you have blonde hair or do you like light eyebrows, use Wunderbrow Blonde. For every woman and every situation we have the appropriate eyebrow gel in our range. Wunderbrow is semi permanent, this means that it is a temporary color that stays longer than with a normal eyebrow gel. Most eyebrow products disappear during the day, often after a few hours. Moreover, these products give off quickly and can not withstand moisture. Wunderbrow is waterproof and very suitable to take on holiday or during a day out. Inadvertently sweeping the eyebrows does not result in annoying streaks, Wunderbrow always stays nice. Wunderbrow gives a natural look for at least two to three days, often even longer. As a result, you are less likely to update your eyebrows. You always look radiant wherever and whenever you are. Are you constantly looking for the best beauty items for yourself, then Wunderbrow is the perfect product. Wunderbrow is for ladies who do not settle for less. A whole day out, in the evening, and in the morning refresh your bed, Wunderbrow is still as it should be. 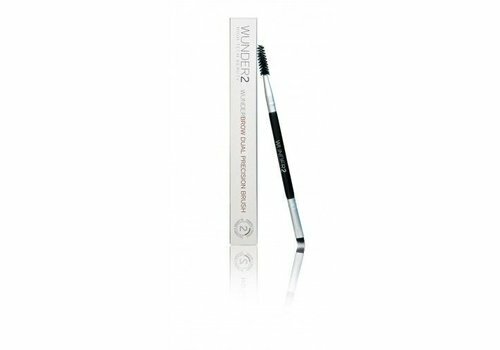 This product is specially designed for anyone with too thin or not beautiful in shape eyebrows. Wunderbrow gives eyebrows a fuller look, no matter what color you use. Boozyshop is fully behind this product, which is why you can find the extensive collection in our webshop. Use Wunderbrow semi permanent eyebrow gel on clean and dry eyebrows. Fill in bare or scarce spots with short and feathered strokes. Use the special Wunderbrow brush, available in our range under the name Wunderbrow Dual Precision Brush. Always work with the hair growth, this gives the best result. Soften and spread the product with the supplied brush up and out, so that the desired shape is created. Do not wait too long, so that the product does not dry. If necessary, re-apply Wunderbrow to lighter areas. For a natural looking result we advise not to apply too much Wunderbrow on the side of the nose. Applying Wunderbrow takes less than two minutes of your time, after some practice you are even ready in 1 minute. Your eyebrows were never updated so quickly. If accidentally some of the product has fallen outside the eyebrow, remove it with a cotton swab or cotton pad. Remove Wunderbrow completely with Wundercleanse, effective and gentle to the skin. Wunderbrow replaces traditional eyebrow pencils and other products. With just one product, you can make beautiful and tight eyebrows, without complicated actions. Get rid of all that unnecessary makeup, Wunderbrow is the answer to your make-up question. Both different shades of eyebrow gel and the Wunderbrow brush are available at Boozyshop.